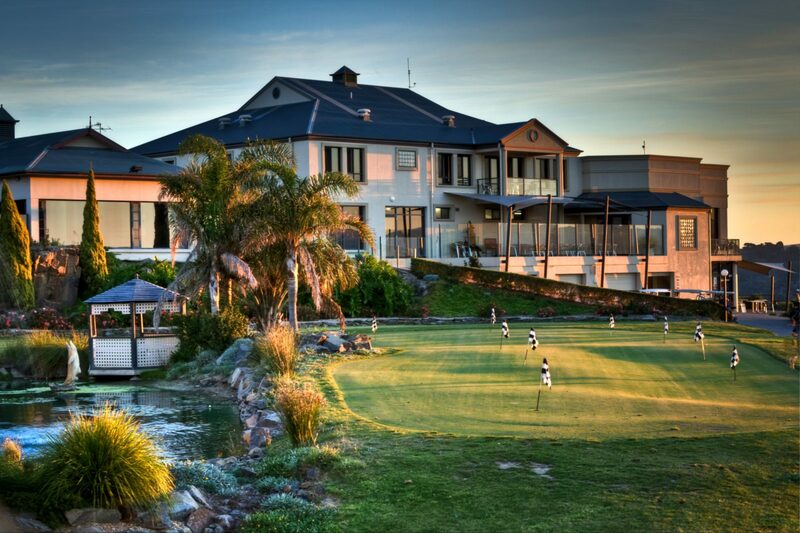 Enjoying panoramic views of the surrounding golf course, McCracken Country Club is a resort located at Victor Harbor on the Fleurieu Peninsula. Many of the rooms, suites and apartments feature luxury spa baths in the ensuite bathrooms to help you really unwind. 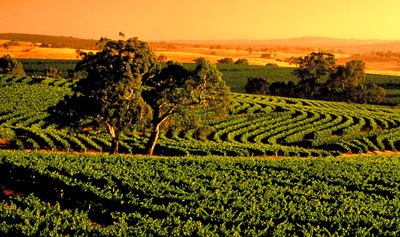 For your dining pleasure, McCracken offers a choice of two superb facilities. 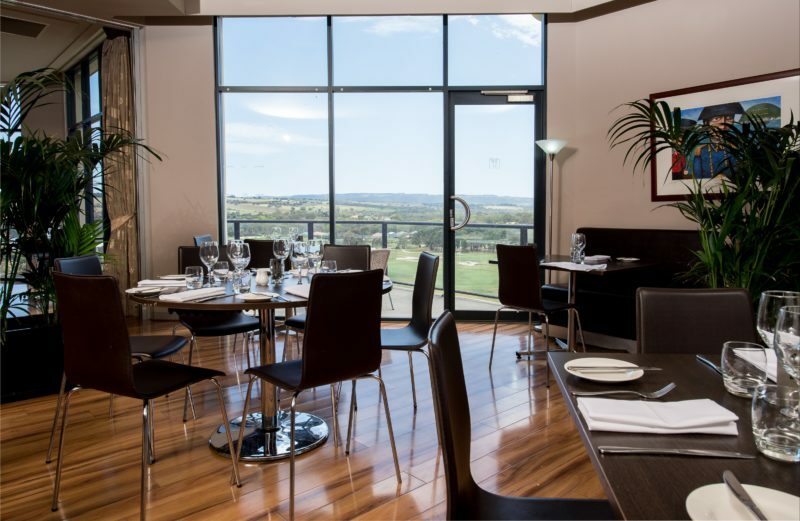 Baudins Restaurant boasts modern Australian cuisine complemented by an extensive wine list and the McCracken Bar & Grill offers a more casual dining experience with licensed bar and gaming room. Some of the additional features of the resort include a Health Club with indoor heated pool, sauna, spa and gymnasium, plus a convention centre, function rooms, cocktail lounge, and the 18-hole championship golf course with driving range, practice putting greens and pro shop. 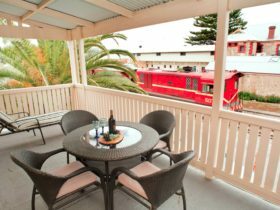 For your next visit to Victor Harbor or enroute to Kangaroo Island, look no further than McCracken Country Club – we trust you will enjoy your stay! Our Resort Spa Rooms are the lead-in room type at the resort. They are a modern hotel-style room with an ensuite bathroom and king size bed. Standard rooms also have an additional single bed, for twin or triple share. Suitable for up to three people. Upgrade to a Balcony Spa Room – situated on levels two and three of the main resort building – and enjoy golf course views from a small private balcony or outdoor terrace. A modern hotel-style room with an ensuite bathroom with spa bath, and a king size bed. Many also have either an additional single bed or a sofa bed, if you need to twin or triple share. Suitable for up to three people. Enjoy a balcony spa room with the additional benefits of basic cooking facilities for your stay. Situated on levels one, two and three of the main resort building, rooms enjoy golf course views from a small private balcony or outdoor terrace. A modern hotel-style room with an ensuite bathroom and king size bed. Suitable for two people. 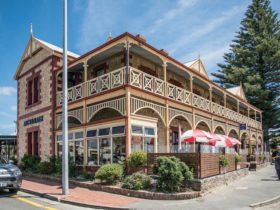 Prime location at the end of the main resort building, this spacious hotel-style room has an ensuite bathroom with spa bath, living area with fold out sofa bed, small kitchenette area and a separate king size bedroom. Suitable for up to four adults when using the sofa bed. Loft Spa Rooms are the located on the fourth floor of the main resort building. They are a modern hotel-style room with an ensuite bathroom and king size bed. Suitable for two people. One flight of stairs is required to access these rooms. 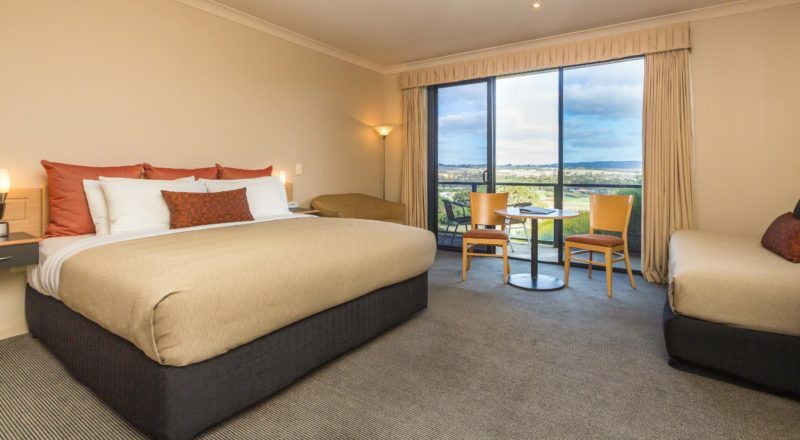 Located on the fourth floor of the main resort building, the Loft Spa Suite is a spacious hotel-style room with an ensuite bathroom with spa bath, living area with fold out sofa bed, small kitchenette area and a separate king size bedroom. Suitable for up to four adults when using the sofa bed. One flight of stairs is required to access these rooms. Located on the fourth floor of the main resort building, this is the biggest and best room available at the resort. A dedicated welcome foyer leads off to a separate kitchenette area, whilst the main spacious living room features a large dining table (with seating for eight), sofa and additional single bed. The two-way bathroom features a large corner spa bath, opening to the bedroom with king size bed. You will enjoy sensational, uninterrupted views of the first tee and a panorama of the course from your private balcony. Suitable for up to five adults when using the sofa bed and single bed. One flight of stairs is required to access these rooms. Situated in our apartment block, enjoy golf course views from the balcony of your room, overlooking the pond to the golf course. A modern hotel-style room that offers an ensuite bathroom with spa bath, a king size bed and a microwave and sink as an additional feature. King bed can be split into two singles for twin share, if required. Suitable for two people. 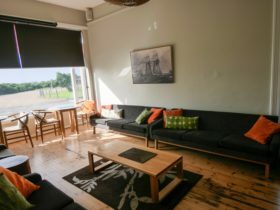 Spacious two bedroom apartments are serviced daily and feature two bedrooms with king size beds, a spacious living area, dining table and fully equipped kitchen. Bathroom with spa bath, laundry facilities and a balcony overlooking the pond to the golf course with outdoor setting and mini barbecue. King beds can be split into two singles in each room, if required. Suitable for up to four people. Combine a two bedroom apartment with an adjacent king balcony spa room and you have an extra spacious three bedroom apartment that’s serviced daily. Three bedrooms with king size beds, two bathrooms both with spa baths, a spacious living area, dining table, fully equipped kitchen, laundry facilities and a balcony overlooking the pond to the golf course with outdoor setting and mini barbecue. King beds can be split into two singles in each room, if required. Suitable for up to six people. 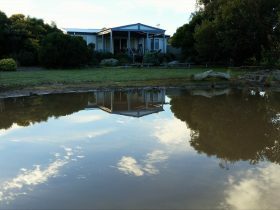 Three bedroom self-contained, attached villa on ground level. 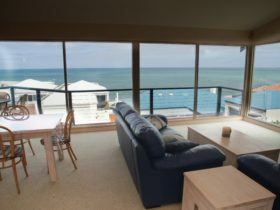 Your holiday home will enjoy access to all of the resorts facilities as well as daily servicing, with kitchen, lounge and dining room, an ensuite to main bedroom and second bathroom with bath (no spa). Each bedroom features a king size bed which can be split into two singles in each room, if required. Suitable for up to six people. Available for both long and short stays. Now pet friendly. Your three bedroom self-contained, attached villa enjoys access to all of the resorts facilities as well as daily servicing. On split levels, upstairs, the main bedroom with ensuite bathroom, a spacious kitchen, dine and living room opens onto a large balcony with views over the tennis court and resort. All other bedrooms are located downstairs with a second bathroom with bath (no spa). Each bedroom features a king size bed which can be split into two singles in each room, if required. Suitable for up to six people. Available for both long and short stays. Now pet friendly. A modern, fully self-contained 4-bedroom, 2-bathroom apartment. Ideal for family holidays, this apartment features a full kitchen, living area, laundry facilities, main bathroom with spa bath and an additional ensuite. Each of the 4 bedrooms feature a king size bed (2 single beds on request). Available for long or short stays.